Canadian Horse Journal: Canada's leading horse magazine. Equestrian Living: Equestrian Living. Home visits, people, style, fashion, decor, travel, and more. New Bridge Polo: Lifestyle equestrian magazine for New Bridge Polo & Country Club. New York Horse: Stories. Advice. Horseplay. Sagebrush Rider: Highlighting Nevada's equestrian community. The Aiken Horse: Covering equestrian activities, Aiken, S.C. 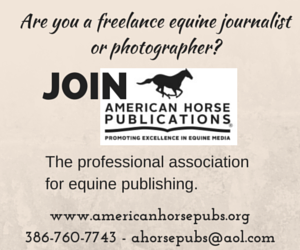 The American Horse Publications Member List is the property of the AHP, which holds the copyright to the list and which will exercise the full rights of a copyright holder and property owner under federal and state law in the event of misuse.